Definition at line 31 of file ContribsPager.php. Definition at line 105 of file ContribsPager.php. References as, DB_REPLICA, RangeChronologicalPager\getDateRangeCond(), messages, ContextSource\msg(), and wfGetDB(). Definition at line 481 of file ContribsPager.php. References $batch, as, Revision\getParentLengths(), isQueryableRange(), NS_USER, and NS_USER_TALK. Generates each row in the contributions list. Contributions which are marked "top" are currently on top of the history. For these contributions, a [rollback] link is shown for users with roll- back privileges. The rollback link restores the most recent version that was not written by the target user. This would probably look a lot nicer in a table. Definition at line 567 of file ContribsPager.php. References $attribs, $lang, $link, $linkRenderer, $ret, $rev, $user, class, Revision\DELETED_TEXT, Revision\DELETED_USER, ChangesList\flag(), Linker\formatRevisionSize(), ChangeTags\formatSummaryRow(), Linker\generateRollback(), ContextSource\getContext(), ContextSource\getLanguage(), Linker\getRevDeleteLink(), ContextSource\getUser(), isQueryableRange(), list, messages, ContextSource\msg(), Title\newFromRow(), null, preventClickjacking(), Html\rawElement(), Linker\revComment(), ChangesList\revDateLink(), Hooks\run(), ChangesList\showCharacterDifference(), tryToCreateValidRevision(), Linker\userLink(), Linker\userTalkLink(), and wfDebug(). Definition at line 448 of file ContribsPager.php. Definition at line 150 of file ContribsPager.php. Definition at line 524 of file ContribsPager.php. Definition at line 476 of file ContribsPager.php. Definition at line 433 of file ContribsPager.php. Get SQL conditions for an IP range, if applicable. Definition at line 397 of file ContribsPager.php. References isQueryableRange(), list, and IP\parseRange(). Definition at line 469 of file ContribsPager.php. Definition at line 367 of file ContribsPager.php. Wrap the navigation bar in a p element with identifying class. In future we may want to change the p tag to a div and upstream this to the parent class. Definition at line 164 of file ContribsPager.php. Definition at line 768 of file ContribsPager.php. Definition at line 238 of file ContribsPager.php. References $revQuery, $user, Revision\DELETED_USER, User\getGroupsWithPermission(), getIpRangeConds(), getNamespaceCond(), Revision\getQueryInfo(), ContextSource\getUser(), ChangeTags\modifyDisplayQuery(), User\newFromName(), ActorMigration\newMigration(), null, Hooks\run(), Revision\SUPPRESSED_USER, and wfTimestamp(). 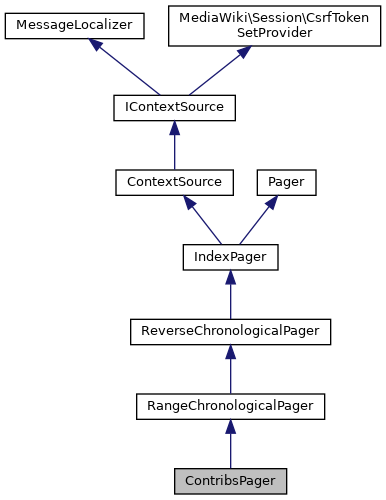 Overwrite Pager function and return a helpful comment. Definition at line 752 of file ContribsPager.php. Definition at line 517 of file ContribsPager.php. Definition at line 441 of file ContribsPager.php. Definition at line 455 of file ContribsPager.php. Definition at line 462 of file ContribsPager.php. Is the given IP a range and within the CIDR limit? Definition at line 415 of file ContribsPager.php. References ContextSource\getConfig(), IP\isIPv4(), IP\isIPv6(), and IP\parseCIDR(). Referenced by doBatchLookups(), formatRow(), and getIpRangeConds(). Definition at line 761 of file ContribsPager.php. Definition at line 778 of file ContribsPager.php. Referenced by SpecialContributions\execute(), ApiFeedContributions\execute(), and ContribsPagerTest\testDateFilterOptionProcessing(). This method basically executes the exact same code as the parent class, though with a hook added, to allow extensions to add additional queries. Definition at line 179 of file ContribsPager.php. References $data, $fname, $options, $query, $tables, as, RangeChronologicalPager\buildQueryInfo(), getIndexField(), list, and Hooks\run(). Check whether the revision associated is valid for formatting. If has no associated revision id then null is returned. Definition at line 536 of file ContribsPager.php. References $e, $rev, $title, and null. Set to true to show both the subject and talk namespace, no matter which got selected. Definition at line 68 of file ContribsPager.php. Set to "newbie" to list contributions from the most recent 1% registered users. $this->target is ignored then. Defaults to "users". Definition at line 47 of file ContribsPager.php. Set to true to show only deleted revisions. Definition at line 73 of file ContribsPager.php. Set to true to hide edits marked as minor by the user. Definition at line 88 of file ContribsPager.php. Definition at line 93 of file ContribsPager.php. Local cache for escaped messages. Definition at line 36 of file ContribsPager.php. Definition at line 98 of file ContribsPager.php. A single namespace number, or an empty string for all namespaces. Definition at line 52 of file ContribsPager.php. Set to true to show only new pages. Definition at line 83 of file ContribsPager.php. Set to true to invert the namespace selection. Definition at line 62 of file ContribsPager.php. Definition at line 90 of file ContribsPager.php. Name of tag to filter, or false to ignore tags. Definition at line 57 of file ContribsPager.php. User name, or a string describing an IP address range. Definition at line 41 of file ContribsPager.php. Referenced by getDefaultQuery(), and getTarget(). Definition at line 103 of file ContribsPager.php. Set to true to show only latest (a.k.a. Definition at line 78 of file ContribsPager.php.